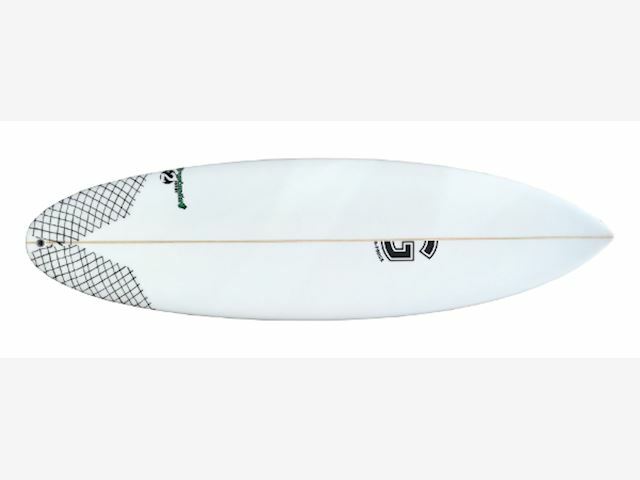 5’11 x 20 3/8 x 2 11/16 36.4L PU, stock glassing, FCS I x 5 I have found that surfers are looking for a one-design travel surfboard, something that can handle most conditions. What comes to mind is my latest design the Kryptonite – a well balanced design that incorporates an old-school nose with a refined modern tail to handle the high performance level of surfing, putting versatility under your feet in most types of conditions – suitable for small 2 to 3ft beach breaks, or banging 8ft J.Bay down the line barrels The clean outline and extra added volume/liters in the nose area, has being pushed forward, making paddling and catching waves much easier. The modern high performance setup in tail area, puts confidence under your feet when drawing flowing turns, or fast hacks off the wave-face, keeping you connected at all times. The bottom configuration consists of a single concave, running throughout the bottom, flowing into a pronounced Vee in the tail, with extra tail-lift for easier control when laying it on the rail. I have added more nose lift and generally more curve throughout for better maneuverability and control when speeding down the line. With the extra added volume, we recommend ordering 2" to 4" shorter than your regular board as the 5 fin setup gives you more options to choose from when surfing different surf conditions. We live, breathe and dream anything & everything surf related. BUY DIRECT & SAVE - TOP QUALITY PRODUCTS DIRECT FROM THE IMPORTER! Check out our website page for more board models and info.